How will you feel if you can actually forecast and win lotto by yourself without looking for any helping hand, yes it's possible to learn how to forecast and win big in Premier lotto, R&S east lotto, Don King lotto, Ghana lotto games and every other lotto in the whole world. I have been a lotto forecaster for the past 5 years and I want to use this opportunity to teach what I have learned for the past 5years about Lotto Forecasting. First, what do I mean by Lotto Forecasting, lotto forecasting implies to prediction or estimate of future events and numbers, which means forecasting is all about predicting of possible next coming numbers and how do we do that? We predict the possible winning numbers using lotto past results to determine what number that might be coming next. If you don't know the meaning and use of this lotto plans such as 2sure, 3direct, permutations and so on then consider reading how to play and win baba Ijebu lotto Nigeria winning number. We are still on how to forecast and win lotto by yourself but I must tell you it required much calculations and commitments and if you are sure you want to learn how to forecast lotto games then keep reading till the end and consider joining this forum to be about to ask questions if you have any. Before you can be good in lotto forecasting you must know the basic system of lotto forecasting which includes the following. One of the most important aspects of lotto forecasting is how numbers are positioned and in this part, you look for how numbers are positioned basically two centre box (CB) numbers on top of each other, two first box (FB) number or two last box (LB) numbers on top of each other. If you use lotto charts or manual hand written board it will look like the example above and if you are forecasting for Lucky G next work then look for where you can see 84 on top of 24 first box using past results for any Ghana games or even other game past results. If you can see 84 on top of 24 first box winning two different places then look to see if they played one particular number and if they do then you have one bank that might come. Other steps you can talk again is looking for where you can see 85 on top of 21 which is the Centre box winning numbers or where 34 is on top of 61 which is the last box winning numbers. Note: You can look for any other position apart from the examples i showed above and remember it doesn't matter if the position is going up or down. As a forecast, you must be aware of lotto counting weeks numbers, start by counting to see if you can see a number that usually comes every 3weeks, 4weeks, 5weeks or more. If you want to count Midweek that will be playing today then start from today and count 3weeks two times and if a number keep appearing every 3weeks and today makes it another 3weeks then pick the number it might be among the winning numbers. Note: It doesn't matter if the number you are counting entered machine number or winning side they are the same sometimes they put it in the machine to make it harder for you to find. 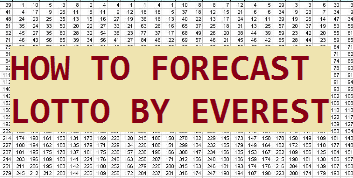 This forecasting plan is for advanced lotto forecasters because you might not find it easy if you are a learner and it's all about monitoring of key position numbers and wait patiently for the maturation day. There are forecasters who have already acquired lots of lotto key's but I assume you want to learn so this plan is partially like the first plan but not the same. This plan works like when you see 78-58 in winning count 3weeks, 4weeks, 5weeks or more to see if it provides one number or more ad the only way to find out is when you find the same 78-58 in winning in different games and 2 of them provides the same number that how to find the key. Secondly, you can look for 2 numbers that are on top of each other counting it till the game day to see if it provides another number. Sometimes winning numbers and machine numbers works hand in hand that is why I don't fail to update lotto winning and machine results because many lotto forecasters will need it in other to forecast. When you see like 20 in the first box winning and then 67-34 in centre box machine you need to look either at your lotto forecasting chart or results board to see if you can see similar position 2 places it might just give you crew of what such position did. This lotto forecasting plan has to do with the position of each number and you are required to look for a similar position to be able to find the hidden lotto winning numbers. Looking at the results above, when forecasting you should be looking for a similar game that played 24-01 or 39-61 position then look for a more similar position in every other chart or board to see after playing that number the next number they usually bring. Note: position can be any of the positions and not a must they must be close what matters is that you see similar position elsewhere that can show you if that position can bring any number. Another complication in lotto forecasting is that when you see a position you might not know if the game is going up or down and when you eventually picks a number from down they will pick from up but I will summarise this article by teaching you how to know when a position is going up or down. When you see a position number you are working on the best way to know if the game is going up or down is checking previous results to see if the have played any number before the position you saw and if you don't see then extend the search for more weeks to see if you will see their starting point that will help you know of the game is going up or down. Finally, as a lotto forecaster, you must have or be familiar with all lotto counterparts in lotto every number has Counter, Bonanza, String Key, Turning, Melta, Partner, Equivalent, Code and so on. In case I don't see the pole to pole position in lucky g, can I use other day's pole to pole that can be found? For instance if I can't find 84-23 in the last position in lucky g but that number position is in national, can I use that? When to use bonanza, shadow, counterparts etc? ?